Direct beach access, ocean views, lush tropical garden - Baan Tamarind is just as you’d expect a luxury vacation rental to be. Set along the powdery sands of Big Buddha Beach, the villa’s seafront location is ideal for beach-goers looking to soak up the sun, sand and sea during their Samui holiday. Featuring five capacious bedrooms, Baan Tamarind is set up for large travelling parties or more than one family to share. Unwind in air conditioned comfort in one of the five bedrooms. 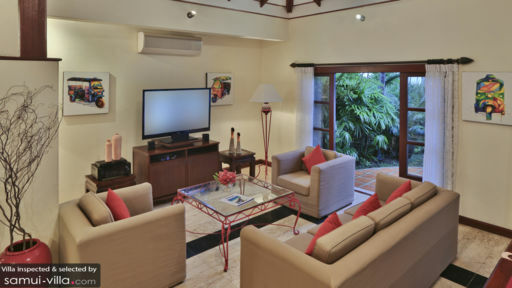 Furnished in a similar fashion, each of the rooms comes fitted with teak floors, custom artwork, wall lamps, walk-in closets and an indoor-outdoor en suite. While all en suite bathrooms boast gorgeous marble-clad interiors, the en suite of the master bedroom sets itself apart with amenities like a built-in cabinet and open air shower. 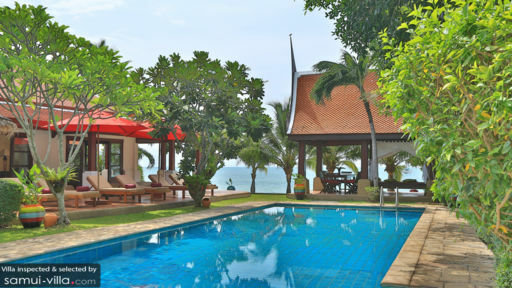 No holidaymaker can resist the wonderfully landscaped compound of Baan Tamarind, abundant with emerald foliage, a neatly trimmed lawn and decorative features. 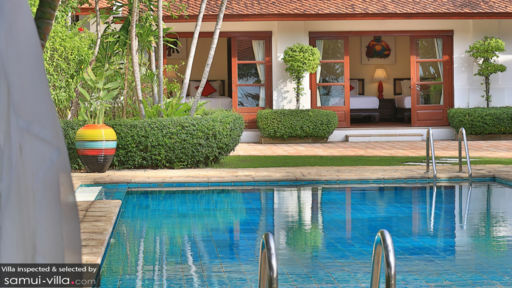 Make a splash in the sparkling pool (it’s large enough to accommodate the entire travelling party), recline against the loungers while you dry off from your swim and enjoy outdoor massages or dine under the Thai-style sala. There’s a large canopy with outdoor seating for moments where you feel like lounging outdoors. A stone beach wall frontage offers step access out to the beach. The generously proportioned living spaces of Baan Tamarind feels airy and welcoming. The interior features exposed timber ceilings, elegant wood fixtures and soft cream hues. Ornaments in shades of red and orange are scattered all around to add pops of colour within. Soak up the relaxed vibes in the living area, which has seating for 10, a massive 50-inch TV with DVD player and satellite connection and billiard table. Meals are enjoyed at an exquisite 10 seater dining table. Adjoining the lounge is an open kitchen equipped with a full range of cooking appliances and a sleek island counter. Baan Tamarind offers impeccable housekeeping services. The compound is kept secure with manned security on the beach frontage during the evenings, and your villa manager will readily assist with all your travel needs. Services available at additional cost include: babysitter, bike rental, boat rental, car hire, driver, laundry and trained massage therapist. Bangrak, known for its white sand coasts and relaxed vibes is a great option for travellers looking to avoid the bustling, more populated beaches of east Samui. Combine your day out at the beach with a visit to the Fisherman's Village. It’s about 2 minutes drive away from the villa, and boasts a lively ambience, along with souvenir stalls, street food carts and high end restaurants. Other travel activities in the area include kitesurfing, frisbee golf, yoga, spa and cooking classes. Kitesurfing conditions are excellent from November till March, and equipment rental and lessons are available at a kitesurfing centre in Mae Nam Town. If you’re looking to sweat it out over a fun game of frisbee golf, the to-go venue is Samui Disc Golf. We recommend The Yogarden Samui, Belmond Napasai and Island Organics for yoga sessions, spa treatments and cooking classes respectively. Its a been a while since I last visited the wonderful island of Koh Samui but this time I was not disappointed by Miskawaan Baan Tamarind. What an amazing experience, the villa, the beach front location and the outstanding service. I will be back.